is a Buddhist nun. From 2004 to 2009 she worked at the Austrian Academy of Sciences on the project which has culminated in the present publication. This collection is unique not only in that it preserves twelve codices unici of hitherto unknown sūtras, but also in its thematic selection which leads to some interesting and hitherto unforeseen insights. 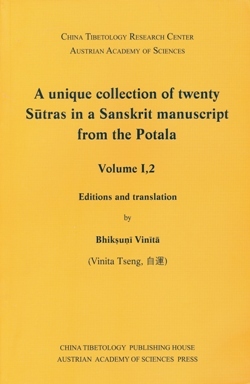 Volume I includes critical editions of the twenty Sanskrit sūtras, mostly later (or Mahāyāna) texts, together with their Tibetan and Chinese translations which are also critically edited, and the author’s English translation. The work combines all the sources and available materials, following the best possible primary and secondary critical methodology. It not only provides new insights into the codicology of Buddhist texts, but also considerable new material for a broader understanding of the Mahāyāna Buddhist literature, religion and thought. A study of the colllection will be the task of volume 2.